Harrisburg, PA – Governor Tom Wolf today laid out an ambitious plan to ensure Pennsylvania’s workforce has the skills and education to succeed in 21st century jobs as the commonwealth’s economy continues to grow. The proposal includes the first major investment in workforce development and skills training, including dedicated funding for STEM and computer science education. 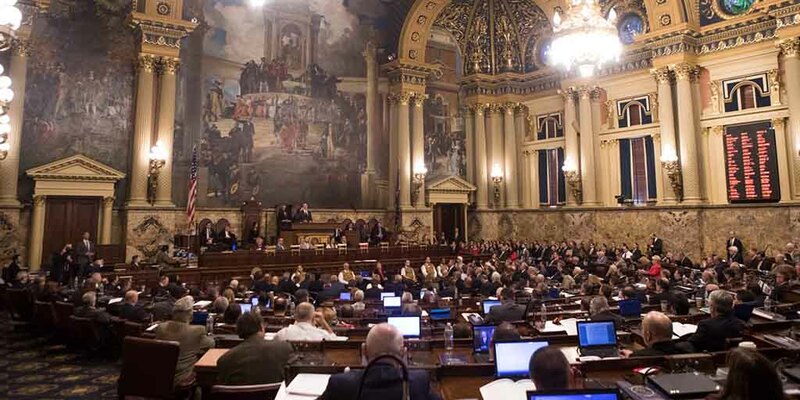 In his 2018-19 budget address, Governor Wolf asked the Republican-led General Assembly to pass a modest, commonsense severance tax that would help ensure all Pennsylvanians benefit from the prosperity of the resources under their feet. “Let’s understand exactly what a severance tax is,” Governor Wolf said. “It’s a tax paid by people mostly outside of Pennsylvania to use our natural resources. And by failing to put in place this commonsense tax, we’re paying other states’ taxes – when we fill up our cars, or heat our homes – we’re paying for Alaska’s schools and Texas’ roads. I don’t know about you, but I don’t remember getting a thank you note from anyone in Alaska or Texas. The governor’s budget proposal continues investments in education and workforce development by providing an additional $225 million to improve education for every student across the state, regardless of ZIP code, and ensures a workforce ready for the 21st century, including $100 million for basic education funding, $20 million for special education, $30 million for Pre-K Counts, $10 million for Head Start, and $15 million for the Pennsylvania State System of Higher Education. The proposal includes $50 million for career and technical education, including $40 million for PAsmart, a new initiative to strengthen workforce efforts at multiple state agencies by aligning those agencies’ work with K-12 and higher education. “Developing a workforce that can compete and win in the 21st-century economy is the single best way to help Pennsylvania businesses grow – and attract new businesses to our commonwealth,” Governor Wolf said. “It’s also the single best thing we can do to help more of our people find better jobs – not just tomorrow, but today. The proposed 2018-19 budget builds on efficiencies realized in last year’s budget, including a commitment to consolidating the Department of Health and the Department of Human Services into one Department of Health and Human Services. “By creating one health and human services agency, we will be able to provide care and assistance to Pennsylvanians in a more simplified, cost-effective manner that builds on shared-services delivery initiatives already implemented and ensures that all receive high-quality services and supports,” Governor Wolf said. Governor Wolf also proposed additional new funding to reduce waiting lists for child care assistance and services for those with autism and intellectual disabilities, and significant new funding to bolster home and community-based care for seniors. The budget continues to support Pennsylvania’s fight against the opioid crisis by expanding access to substance use disorder treatment, prevention and education to ensure those suffering from this disease are steered into appropriate treatment and recovery. The transcript of the budget address as prepared is available below and here. “Lieutenant Governor Stack, Speaker Turzai, President Scarnati. . .
Before I begin I want to take a moment to congratulate the Philadelphia Eagles, the city of Philadelphia, and all of Pennsylvania. I know, just like we’re sometimes split between parties, we’re also split between Eagles and Steelers here in the Commonwealth. But we’re all fans of Pennsylvania and the Eagles and their devoted fans deserve this moment and we should all be happy to share it. And now we have seven Super Bowl trophies in Pennsylvania. That’s something we can all be proud of. Just like many of us have so much pride in the Eagles, the story of our Commonwealth has always been a story about pride. We Pennsylvanians have always been proud of the work we do. Proud of the industries we’ve built. Proud of the communities we grow up in, and raise our kids in. Proud of the traditions we pass down through the generations. But, by the time I took this office three years ago, the economy had changed – and the Commonwealth we love was headed in the wrong direction. When I stood outside this building on that Tuesday afternoon and took the oath of office as Pennsylvania’s Governor, I talked about what made our Commonwealth a place we are all so proud to be from. A place where we build things. A place where you can find work that puts food on the table and allows you to save up for college or retirement. A place where you can watch your kids grow up and find jobs of their own – maybe even start their own business someday and sign the other side of the paycheck. I believed then, as I believe today, that the people of Pennsylvania have what it takes to restore those values and rebuild our prosperity. What was standing in our way wasn’t our work ethic or our entrepreneurial spirit, but a kind of political paralysis – a status quo in which, too often, politicians in Harrisburg simply couldn’t find a way to make the tough decisions and smart investments we would need to get back on track. So I promised that I would challenge that status quo here in Harrisburg. And that’s what I’ve tried to do for the last three years. Sometimes, that’s meant challenging this legislature to step out of its comfort zone. Sometimes, we’ve worked our way to compromise. Sometimes, I’ve been forced to move forward on my own. We still have a lot of work to do. By taking on the status quo here in Harrisburg, we’ve already begun to write a new story for our Commonwealth. Not a story about a past we’ll never get back. But a story about a brighter future we can build together – if we can muster up the political will to do it. Where else could the story of Pennsylvania’s future begin than in our schools? Long before I was Governor, I was a parent who knew that nothing is more important than being able to give your child the opportunity that comes with a great education. I was also a business owner who knew that nothing is more important than being able to find qualified employees. And so I knew that we couldn’t bring back our economy until we brought back our public education system. I knew that businesses would not invest in Pennsylvania until Pennsylvania invested in its schools. That’s why the first thing I did when I got to Harrisburg was to draw a line in the sand on education. Over the last three years, we’ve invested in our schools and reversed the billion dollars in cuts that were made under the previous administration, cuts that led to larger class sizes, mass layoffs of educators, and cuts to programs like full-day kindergarten. And we’ve already begun to see those investments pay off. Today, we have nearly 100,000 students enrolled in full-day kindergarten, and we’ve increased the number of kids able to attend pre-kindergarten by nearly half. Our high school graduation rate is more than 86 percent, making us a national leader. We’re second in the nation in STEM education, preparing our children for the jobs of tomorrow. And we’ve increased the number of career and technical education students earning industry-recognized certificates by nearly 33 percent, preparing them for the jobs our employers are trying to fill right now. Rebuilding our schools is the beginning of rebuilding our economy – but it’s just the beginning. For three years now, we’ve been working to create more jobs that pay in every corner of our state. Since I took office, Pennsylvania has gained nearly 180,000 jobs. And in the last year, we led our region in job growth. Many of these jobs are from direct investment by the commonwealth. For example, the investments we’ve made in the Shell Cracker Plant, the port of Philadelphia, the online retailer in Paoli, and the steel plant in Johnstown are on pace to create more than 15,000 jobs. The workforce development partnerships we’ve forged are on pace to train thousands of workers for jobs that are sitting open right now. Over the last three years, we’ve repaired or rebuilt 1,600 bridges, and more than 18,000 miles of roadways. And over the next decade, we’re going to invest $2 billion more in rebuilding roads, highways, and bridges across our Commonwealth so that our people can get to work and our products can get to market. It is for these reasons that I think a company like Amazon is considering Philadelphia or Pittsburgh as the location of its second headquarters. Businesses don’t invest in states that don’t invest in education, infrastructure or job training. We’re doing all of these things, and I am hopeful Amazon will come here, build here, and expand here. Meanwhile, we’ve also gotten rid of burdensome taxes like the Capital Stock and Franchise Tax, cut red tape that made it harder to build a small business, and streamlined the services we offer so that our government can be an ally, not an obstacle, for entrepreneurs looking to get started right here in Pennsylvania. In fact, this week, we followed through on a promise I made last year by launching a one-stop shop for businesses and business owners to access state services. There’s more to do, from expanding access to the internet to every corner of the Commonwealth to a new workforce program called PA Smart that will consolidate our workforce development efforts into another one-stop shop. And speaking of our workforce, in this year’s budget, I’m proposing another major step forward: a significant investment in career and technical education to help make Pennsylvania a better place to learn, a better place to work – and a better place to do business. Developing a workforce that can compete and win in the 21st-century economy is the single best way to help Pennsylvania businesses grow – and attract new businesses to our Commonwealth. It’s also the single best thing we can do to help more of our people find better jobs – not just tomorrow, but today. Indeed, these aren’t just jobs, but careers – everything from welding and machining to coding and advanced manufacturing – careers that can sustain families and enrich communities. And these careers aren’t reserved for people with four-year degrees. Anyone in our state who’s willing to put in an honest day’s work deserves a shot to make a good living – and by investing in these programs, we can give them a chance to gain the skills they need to do it. For example, at LCR Embedded Systems in Norristown, there’s a man named Michael Rosenberger – who is here today – who works on the manufacturing line, servicing a major contract. Eight years ago, he would never have expected to be in that high-level advanced manufacturing position. He didn’t have a college degree, and he was working at the plant as a janitor. But Michael was a great employee – a smart guy who took the work he did to heart, no matter what it was. And he wanted to do more than just collect a paycheck. He wanted to build a career making things right here in Pennsylvania. So, thanks to a workforce training program through the Department of Community and Economic Development, he was able to get additional training at Montgomery County Community College. With his new skills, he was able to move up to the assembly floor. And then he got promoted again, to the machine shop. Here’s a guy who had had no formal experience in machine shop work until he got this additional training – and, now, he’s the head of the entire machine shop at LCR, and a role model to his fellow employees. Michael’s making more money – and making an even greater contribution, not just to his family and his employer, but to his community. There should be a place in Pennsylvania’s future for people like Michael. There should be a place in Pennsylvania’s future for anyone willing to work hard to make a better life – and I hope you’re ready to work with me to make that happen. I’m hopeful because, over the last three years, we’ve begun to see progress in changing the way things work around here. But I’m also well aware that, sometimes, progress doesn’t come without a push. When I took office as Governor, I knew that I had to set a new tone here in Harrisburg. That’s why I banned anyone in my administration from taking gifts from lobbyists, I got rid of pay-to-play contracting, I refused to take a salary or a pension, and I paid for my own health insurance. But the people of Pennsylvania had a right to expect much more from their government. Even though they elected a Democratic Governor and a Republican legislature, they expected all of us to find ways to work together for Pennsylvania – and they expected us to deliver results. Now, it has always been, and will always be, my preference to work with the legislature. When we’ve found ways to do that, we’ve been able to get a lot done for the people of Pennsylvania. That’s how we expanded our response to the opioid crisis, arming law enforcement with the tools they need to fight this epidemic on the front lines and helping thousands of people struggling with addiction get access to the treatment that could save their lives. Working together, we’ve reduced the prison population, while lowering Pennsylvania’s crime rates. Despite this, our cities still face issues of violence, and we need to work together – legislators, the administration, and Attorney General Shapiro – to make our cities and communities safer so violence is never an obstacle to opportunity. Working together is how we enacted a fair funding formula in our education system that takes politics out of school funding and makes sure that your zip code doesn’t determine what kind of education you can get. That’s how we solved one of the thorniest problems in Harrisburg – reforming our pension system in a way that’s fair to our workers and fair to our taxpayers, so we can stop wasting so much money on Wall Street fees, meet our obligations, and start paying down our debt. That’s how we finally made medical marijuana legal so that patients in our state can get access to the medicine they need to live without pain. And that’s how, at long, long last, we reformed our liquor system. And when some in the legislature haven’t mustered up the political will to work with me, I have no problem doing the work on my own. Whether it’s expanding Medicaid to cover 715,000 Pennsylvanians, and cutting our uninsured rate to the lowest it’s ever been, expanding opportunities for seniors to stay in their homes while they get the care they need as they age, or streamlining agencies in state government, I have done things on my own to help the people of Pennsylvania. But Harrisburg works better – Pennsylvania works better – when we work together to make it work for everyone. When it comes to this year’s budget, working together will be easier than in years past, because, after decades of neglect and years of crisis, we have finally begun to tame the fiscal beast that haunts Harrisburg. No one here needs reminding that Harrisburg’s chronic inability to deal with that crisis has long been the most visible symbol of what’s wrong with our state’s government. And I’m proud that we’ve begun to change that story. Some of the work, I’ve been able to do from the Governor’s office. Taking a business owner’s approach to our budget, we were able to tighten our belts, cutting $2 billion by streamlining our bureaucracy and saving Pennsylvanians another $700 million by cracking down on fraud and abuse. Some of the work, we’ve been able to do together, like making full pension payments, reforming our criminal justice system to reduce our prison population, and lowering health care costs. And because we’ve begun to take a new approach to our budget, I can come before you today with a budget that makes the investments we need to continue our progress without any tax increases on Pennsylvania families. I’m going to keep doing whatever I can to reduce costs and streamline government. But we can do so much more to improve our fiscal future if we work together. And that brings us to the severance tax. Pennsylvania is one of the few states fortunate enough to have abundant natural gas resources. And yet we are the only one of those states without a severance tax. Everywhere else – Texas, Oklahoma, Louisiana, Alaska – they’re bringing in billions of dollars from the oil and gas industries. That money’s going to fix roads, build schools, and keep taxes low. And let’s understand exactly what a severance tax is. It’s a tax paid by people mostly outside of Pennsylvania to use our natural resources. And by failing to put in place this commonsense tax, we’re actually just paying other states’ taxes – when we fill up our cars, or heat our homes – we’re paying for Alaska’s schools and Texas’ roads. I don’t know about you, but I don’t remember getting a thank you note from anyone in Alaska or Texas. Pennsylvania is blowing most other states out of the water when it comes to production. And by joining every other gas-producing state and passing a severance tax, we could also join them by bringing billions into our own coffers. Ask these oil and gas behemoths to pay their fair share for extracting Pennsylvania’s bountiful resources, and we can build a brighter future for Pennsylvania. Folks: This is only hard if politicians choose to make it hard. So why isn’t it done? Well, the truth is, as rich as our Commonwealth is in some natural resources, special interests have put political courage in short supply. Look, I get it. The oil and gas industry, they’re powerful. But in the time I’ve been here, I’ve seen people in this legislature – even people I disagree with about pretty much everything – set politics aside to do what’s right. I believe you have it in you to do it again. Pennsylvania is counting on you to do it again. So, today, I’m not just asking you, but challenging you, to do the right thing and pass a severance tax this year – so we can keep making the investments that will grow our economy, keep making progress on the issues Pennsylvanians care about, and keep writing the proud story of a brighter future for our Commonwealth. After all, the Pennsylvania we all are so proud of – the place where you could work hard and earn a good living, raise your family in a strong community, watch your kids find opportunity of their own – it wasn’t magically bestowed upon us. It was built, by generations of people who did hard things, together. It’s our turn to make the tough decisions with courage and conviction. It’s our turn to invest in new technologies, inspire new discoveries, and incubate new industries. It’s our turn to build a stronger and fairer economy; healthier and safer communities; and new opportunities for the next generation. It’s our turn to finish writing the next chapter in the story of this great Commonwealth. I have never been more proud to be a Pennsylvanian. I have never been more confident of our people. I have never been more hopeful of our future. And if you feel the same way, consider this budget proposal an invitation to join me in building that future, together.